On March 16, 2012 I jumped on Facebook, like I do every morning, to see what’s in my news feed. 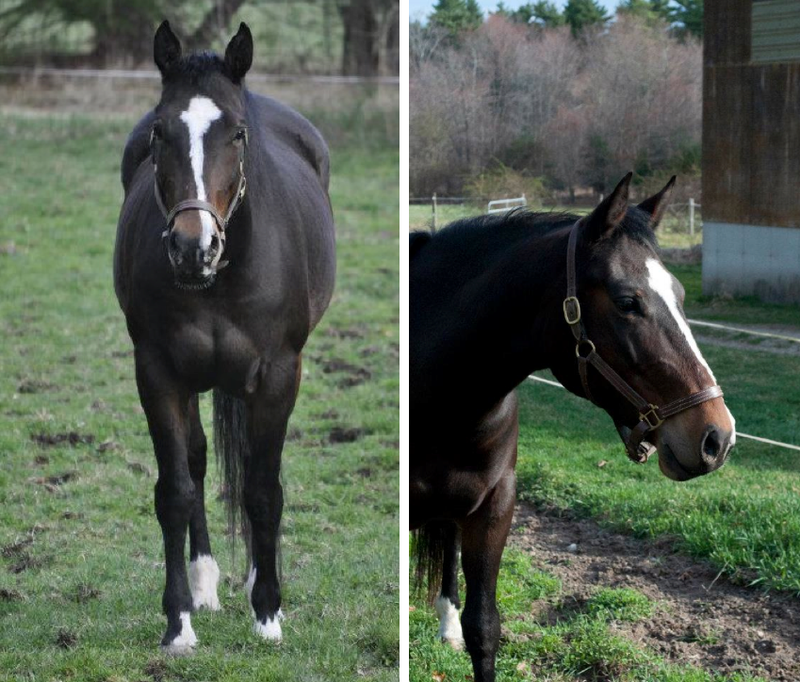 This particular Friday morning someone had shared a photo from the “Camelot Weekly Auction” (in NJ) with her comment of “I want this horse.” I looked at the photo of hip #97 and I thought to myself “I want that horse!” By the picture description I found out that she was six years old, 15.1-15.2 hands and was a trail horse. The picture showed a nicely put together (maybe a little long-backed) dark bay with a stripe horse and three white socks. So I did what any rational horse lover would do. I irrationally called my husband and asked him if we could buy a rescue horse, sight-unseen, off of a credit card. After a negotiating (and promising to make a ton of money with her as a sales project), we ended the call with him telling me: “Do what you feel you have to.” Of course my next call was to the auction house in New Jersey to purchase her. I was a little hesitant on the phone, but the representative assured me this mare was extremely sweet and if she could take her home herself she would. That sealed the deal. I hung up a proud horse owner. My plan was to drive up after work to NJ with my horse trailer, stay overnight in a hotel, and drive back after picking up hip #97 on Saturday morning. After sharing posts of my newly purchased horse on Facebook I got an education in buying an auction horse. DO NOT ship the horse myself since I show so much, and diseases and bacteria could be transferred in my trailer. DO NOT allow the horse to go right into my barn – QUARANTINE first. Huh. I hadn’t thought of that. Now I had to find a shipper AND some place to quarantine her. I remember one of my co-workers SmartPaker Kristina, had bought a horse from Camelot last year. So I started asking her what she did. Although she shipped the horse herself, she did have a stall with a paddock close by, well away from her other horses that she used to quarantine her horse Cash. She then proceeded to offer to let me board hip #97 there for a month. I’m so lucky to work with such awesome people! Shipping was pretty easy. I called the auction house back and they gave me the number of a woman who was picking up four from Maine in a six-horse rig and would have room for me. A quick call later and I had a shipper. The dark bay mare arrived midday on Monday. The first thought as she stepped off the trailer was – “hmmm, she looks a little smaller than 15.1/15.2 hands”. But she was just as sweet as the Camelot representative said, and so I settled her in and left her for the night. Despite a bout of “shipping fever” while in quarantine and a nasty cut to the bulb of her heel (that I kept wrapped for a few months), quarantine was over before I knew it. During the last week at Kristina’s farm, my sister and I went up to ride her. It was very obvious she was green, but she seemed willing and only a little hesitant. She seemed very calm and non-spooky. Mindset-wise I knew this horse was going to be really easy-going and fun. By that point I decided I had to name her. Don’t tell anyone but I LOVE the whole Twilight Series. I figured if there was one time in my life I would name a horse after a character in that series, it would be now. Hip #97’s show name would become “Bella’s Lullaby.” Bella came home, to my own farm, on April 14th. Everyone thought the name seemed fitting of a pony (she has a USEF pony card now, too). Bella has had some setbacks over the past year. Shortly after arriving home, Bella came down with Ehrilichia (a tick borne disease). Then there was on/off lameness that through many vet visits and x-rays has been diagnosed as navicular. Pain meds, special showing, and of course SmartPaks help keep her going. Due to this condition, I’ve decided to own her for life and just keep training her – keeping her healthy and pain-free, under my direct care. 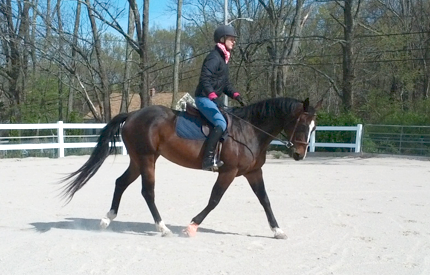 Starting training at home April/May 2012 (foot still wrapped from injury sustained while in quarantine). Bella and I went to our first show in April 2013. I went by myself, just Bella and I. We entered the elementary hunter division open to green horses and green riders. I walked into the under saddle portion, and of 15 riders I was the only one not in jodhpurs and bows. I actually thought I was in the wrong class. We didn’t pin on the flat, being the only green horse in the ring, but over fences we took two pinks. The rest of the day I got teased by my friends about how I was stealing ribbons from little kids. LOL! I’m looking forward to showing Bella more and continuing to put more training into her. She retains her super sweetness, and loves to be pampered. She loves to go trail riding, and loves to steal the heart of anyone who meets her. Jessica, I just love the story of you and sweet Bella. Best wishes for future training. I have to ask, you as a smartpak person, why would you be jumping a horse with navicular? That is just adding to the problem and pain. 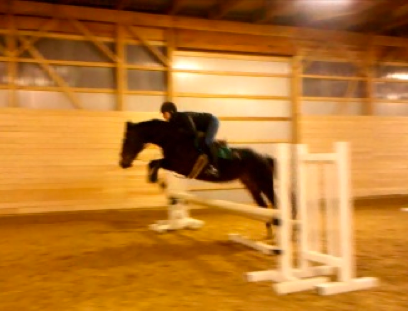 I had an OTTB with navicular and he was a great trail horse, not a show horse, on the rare occassion that I tried to jump him, before we found the problem, he would be off for up to a week. No amount of meds is going to change that problem, so if I were you, I’d rethink some of the training and find something Bella is comfortable with. Believe me, she will tell you what it is. There are many horses who have navicular that have long, happy, healthy jumping careers thru corrective shoeing and other management methods. I am hoping Bella will be one of those. Everything I do with Bella, I have the 100% backing of my vet. I would never do anything that would hurt my horses, and Bella is sound and happy with the help we are giving her. She LOVES to jump and will drag me towards them in the ring, so in that regard Bella is telling me what she wants to do. That said, every horse is unique, so any rider concerned about their horse’s soundness should work with their veterinarian to find the right plan for their horse. Your vet is always your best resource, as they know your horse best! Thank you very much for your concern, Bella and I both appreciate it. What did you do for your navicular horse??? I am desperate. 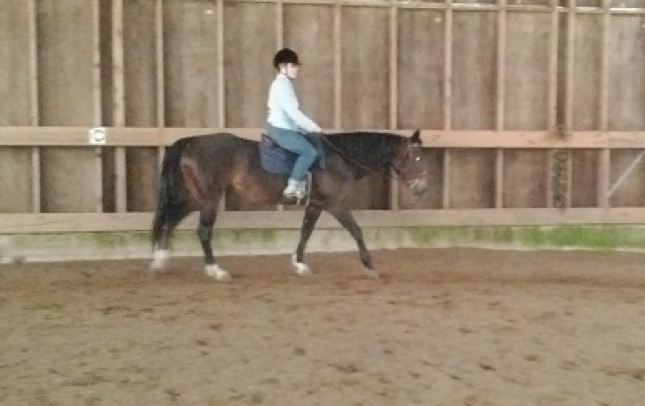 I bought a yearling, did the ground training and then started (walking, trotting) barrels. Has not been overworked for sure. I noticed he seemed stiff in the shoulders, I thought. So, before he turned 3 I took him to the vet and he said navicular both front feet. I was sick! I love this horse so I went out of state for 2nd. Opinion. He got better X-rays and agreed that on a scale of 1-10 he was probably an 8 on severity. Told me I’d probably have to put him down in a couple of years. Now I’m really sick and get nauseated every time I see him gimping. I do not ride him but I hear all these other peoples stories of keeping on with their careers. How are they doing it? I’d be happy just to keep his pain down and maybe a little trail riding. Does anyone have any suggestions????? Please. I recused a quarterhorse from the local animal shelter last year since thyat day I’ve spent a lot f time just on him intraining by myself to the trails here in San Bernarndino. His name is Bubbles. He still has a lot to learn for a 4year old and I love him for what he is a love bug horse he loves carrots and the grannysmith apples.